Even before the new Hurricane was rolling off the production lines in March 1937, Sidney Camm had moved on to designing its future replacement as a private project. This was to be a massive plane designed around the equally massive Napier Sabre engine. The work proved useful when Hawker received specification F.18/37 in January 1938 from the Air Ministry, which asked for a fighter based around either the Napier Sabre or the Rolls-Royce Vulture engine. The engines were similar in that they were both 24 cylinder designs that were designed to deliver over 2,000 hp (1.5 MW), and different primarily in the arrangement of the cylinders—an H-block in the Sabre and an X-block in the Vulture. The two resulting models became known as the "R" and "N" (based on the engine manufacturer) and were very similar—the Vulture-powered R plane had a rounder nose profile and a ventral radiator, whereas the Sabre-powered N had a flatter deck and a chin mounted radiator. 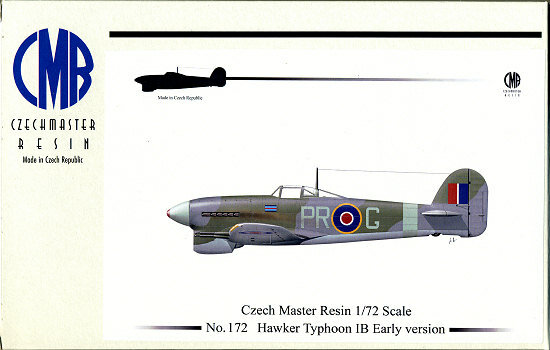 The basic design of both continued the Hawker tradition of using "older" construction techniques; the front fuselage was welded steel just like the Hurricane, and the design used a massive 40 foot (12 m) wing that was much thicker than those on designs like the Spitfire. Camm did give in to the times for much of the rest of the plane though; it was semi-monocoque from the cockpit rearward, flush riveted, and had wide set gear. Instead of sliding or lifting canopy the Typhoon came with a side door. The R version first flew in October 1939, and the RAF was so impressed they ordered 1,000 as the Tornado. Various problems, notably compression effects which were previously unknown to Hawker, slowed down its service entry. In addition, the plane had rather disappointing climb performance, which meant it would not be replacing the Spitfire as an interceptor. In February 1940, the first N model, now known as the Typhoon, was delivered. The RAF placed a large order for it as well, but moved production to Gloster Aircraft who had no designs to produce at the time. Like the Tornado, the Typhoon was soon demonstrating its own problems, including vibrations from the engine causing the wing skinning to peel. Eventually the RAF cancelled all work on both models in May 1940 so that Hawker could concentrate solely on the Hurricane during the Battle of Britain. This was the design's first brush with cancellation. Some small-scale work continued with changes to streamline the fuselage and incorporating a much thinner wing were looked at, as well as alternate engines in the form of large radials. In October, pressure on the RAF eased and work was allowed to continue on the two original designs. The first full production version Tornado was delivered in early 1941 and demonstrated the then unheard-of speed of 425 mph, fully armed. This was also the last Tornado. While production lines were being drawn up, the Vulture engine project was suddenly terminated by Rolls-Royce and the Tornado was left without an engine. However the Typhoon had "good enough" performance to warrant production. The first production Mk IA was delivered in May 1941 with 12 Browning .303 guns, but this was followed quickly with the Mk IB with four Hispano 20 mm cannons. By this time the Spitfire Vs were encountering the superior Focke-Wulf Fw 190 in combat and suffering heavy losses, with the inevitable result that the Typhoon was rushed into squadron service (with Nos. 56 and 609 Squadrons) to counter the new German plane. Sadly, this decision proved to be a disaster, and several Typhoons were lost for mysterious reasons. Once again there was talk of killing the Typhoon. The cause of the tail failures was eventually identified only because one pilot managed to survive and return to tell his story. The problem was found to be caused by fatigue failure of the elevator mass-balance, allowing elevator-flutter to occur which was at its greatest when pulling out of a dive. Diving out of combat was the favourite escape manoeuvre for the Fw 190, which had a distinct speed advantage over the Spitfire. Against the Typhoon this manoeuvre should have proved deadly for the Fw pilots, but flutter problems turned the tables. As a "temporary" measure, rectangular strengthening "fishplates" were riveted around the fuselage/empennage joint, the site of the failures. These fishplates remained a feature on all subsequent Typhoons. Problems with leakage of exhaust fumes into the cockpit and subsequent high carbon monoxide levels also meant Typhoon pilots had to use oxygen for even low level operations. The Sabre engine was also a constant source of problems, notably in colder weather where it was very difficult to start. Due to the efforts of operational pilots like S/L Roland Beamont (609 Squadron), the Typhoon continued under development despite these design drawbacks. And there we will leave the history of the Typhoon until another day. By now you should be used to seeing what comes in a CMR kit. There is a compartmentalized polybag holding all of the parts, a color etched fret by Eduard along with a set of canopy and wheel masks. Two different vacuformed canopies are provided, one with a teardrop bubble on the top and one without. The finely molded resin parts include a pair of hollow fuselage halves with some sidewall detail. A pair of fully formed wings with wheel wells, a complete prop blade, separate doors, and a ton of bits for under the wings. You have a choice of drop tanks, long range tanks, bombs of 1,000, 500, and 250 lbs and a choice of Mk.I rockets and rails. There are even alternates for the wing cannon, depending on whether or not you want them covered or with an alternate position recoil spring. In fact, I'd say that the majority of parts are for weapons. The color photoetch fret is mostly for the cockpit. The kit also includes what looks to be injected plastic landing gear to handle the weight of the kit. Markings are for three planes. One is the box art aircraft of 'Beau' Beaumont from 609 Squadron in late 1942. Second is a similarly marked plane from 182 Squadron in the same time frame. The third option is for WCdr D.E. Gillam of the Duxford Wing, also in late 1942. All planes are in Dark Green/Ocean Grey over Medium Sea Grey with a Sky fuselage band and spinner. They also have yellow wing bands to keep from confusing them with Focke-Wulfs. 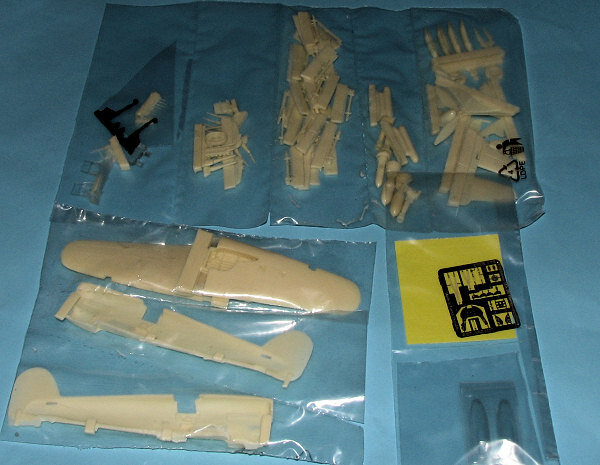 As a note, none of these have reinforced empennages, nor does the kit have them molded on. Instructions are basically two pages of exploded views for the build, a sheet of decal/color information and a sheet with photos of the extant aircraft at Duxford for detail work. Yet another beauty from CMR. Though there have been other kits of the Typhoon in 1/72 by Airfix and most recently by Academy, I think you'll agree that this has to be the finest 1/72 Typhoon IB currently available. My thanks to Czech Master Resin for providing the review copy.